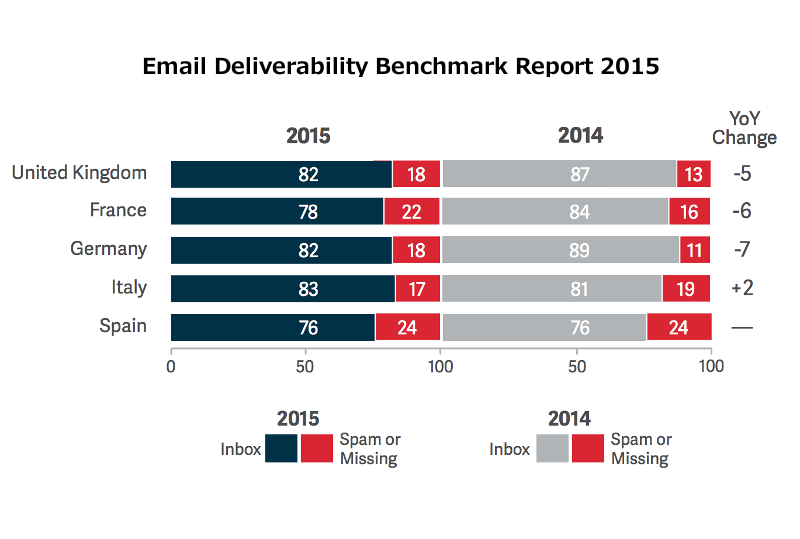 The recently released Return Path Email Deliverability 2015 Benchmark Report found that the situation is worse than a year ago, meaning that every 5th marketing email fails to reach the consumers inbox. Return Path analyzed more than 350 million marketing emails, and these were not emails sent out by mere robots: they were created by recognized brands, sent to customers who subscribed to the lists. Still, the average deliverability rate is only 79% today – while a year ago it was 83%. That’s a significant drop. 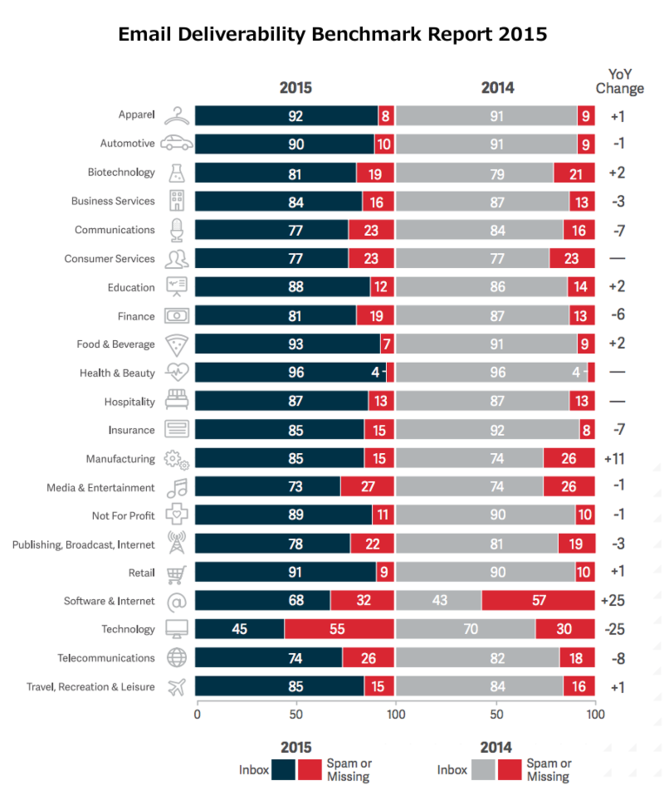 The luckiest industries as the study reveals are the Health & Beauty and Food & Beverage ones with over 90% of their emails reaching the customers. The Technology industry however only manages to reach less than half of their recipients’ inboxes. If we look at the figures by region we can see that North America experienced a sharp decline with deliverability going from 87% to 76% in a year in the United States, and also dropping 4% in Canada. How to avoid the SPAM folder? You obviously don’t want any of your emails to land in SPAM. You have crafted them with patience and creativity, creating great headlines, and packed everything into a compelling responsive email message with your email editor, so of course you want people to see and read it. Here are some basic rules you should obey to reduce your chances of ending up in SPAM. Just as in SEO, in email marketing you should grow your audience organically and forget the shady methods. Most of all forget about purchasing or “mining” email lists! Sure, it is tempting to just buy a list with a million addresses, but it can hurt you much more than it helps even in the short run. This is because most of these leads are likely to be dead or will soon be. And the more email you send out to dead addresses and spam traps, the more likely it is for you to be noticed and blacklisted as a “bad sender” by inbox providers. Provide great content instead, and build your own list. Keep an eye out for dead addresses and regularly clean your list. Also, look out for SPAM filters. Algorithms today are very smart: they analyze your message. Don’t use the words free, buy, offer etc. too much. This also probably won’t attract your audience. If your headlines scream that you want to sell them something a lot of them will mark your email as SPAM. Don’t be harsh, deceptive or misleading: offer what you have, but offer it in a way that people will be interested in it, and not because it’s “free” or “limited“. The best for you is to avoid pushy sales-language all together. Use a reliable Email Service Provider, an email editor which lets you design emails that are not just like any other of the millions of spam mails sent out every day and use an IP and domain that is not blacklisted and is trustworthy in the eyes of providers. What you should do is play fair. You should not be thinking about how to manipulate algorithms and consumers, but provide great content, spend a lot of time with a responsive email editor to craft beautiful designs and give out something that has value. *You have to make them love you *– and you will be successful in delivery, customer relations and sales as well, without being just another “spammer”.